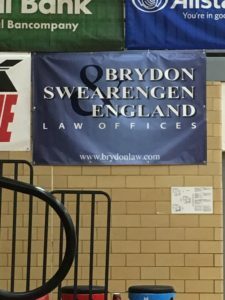 Brydon, Swearengen & England P.C. again this year sponsored a team in the Machens Great 8 high school basketball tournament held in Jefferson City. The Machens Great 8 is a part of the Jefferson City Holiday Hoops Showcase, which includes boys and girls teams from Misosuri and many other states. BSE had the pleasure this year of sponsoring Raytown South High School from Raytown, Missouri. Raytown South and Coach Aaron Ihm provided 3 games of enjoyable basketball against teams from Whitehaven, Tennessee; Oxford, Mississippi; and Tolton Catholic High School. Sevon Witt, 6’6″, 200 lb. forward from Raytown South was named to the all tournament team. Dean Cooper and Ben Cooper were the hosts for Raytown South.